The Echo Game, produced by Lead Balloon Pictures and directed by Brian Feeney, marked my third collaboration with the director. After two short films together we tackled a feature. I remember being completely excited hearing the story pitch at a coffee shop in West Hollywood. A marathon two weeks of shooting with some very late nights, but I didn't want it to end. This was my kind of horror film--Firestarter was one of my favorite scary movies as a kid. The creative talent was fantastic. Our producers, Doug Spice and Asa Shumskas-Tait run Psychic Bunny Productions. I suggest signing up for the newsletter because it always makes me laugh. John Ross, co-writer and producer has directed his own feature that went on to festivals and distribution. The Director of Photography, Jeff Waldron, went on to win an Independent Spirit Award for another project and our composer Austin Wintory (Grace) took the film to another level. The cast was dynamite and I'm hoping to team up with one or more of them again. The Echo Game went on to play in many horror film festivals and was released on DVD. Dread Central covered the DVD release here. Woo hoo--Halloween 2012 and The Echo Game is BACK on VOD! Thanks Dread Central for the write up! 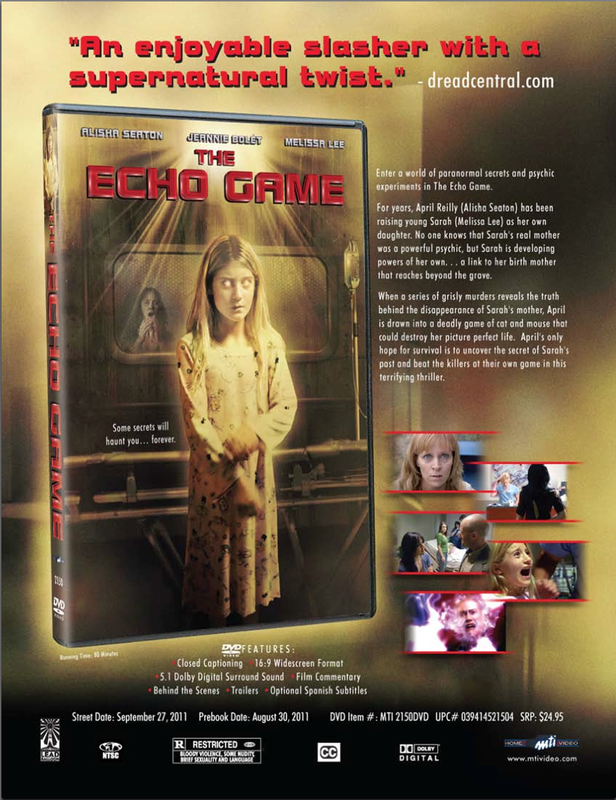 "Brian Feeney's psychological thriller The Echo Game is making a triumphant return to the video on demand universe via Time Warner Cable and Comcast Xfinity, just in time for Halloween! Check out the new NSFW European trailer and three clips."